The Finance Committee and the Board of Directors of HUUC asks members and friends to please consider financial support for our congregation. Individual pledges have significant budgetary impact on all our ministries, enabling us to move forward and avoid a deficit budget. 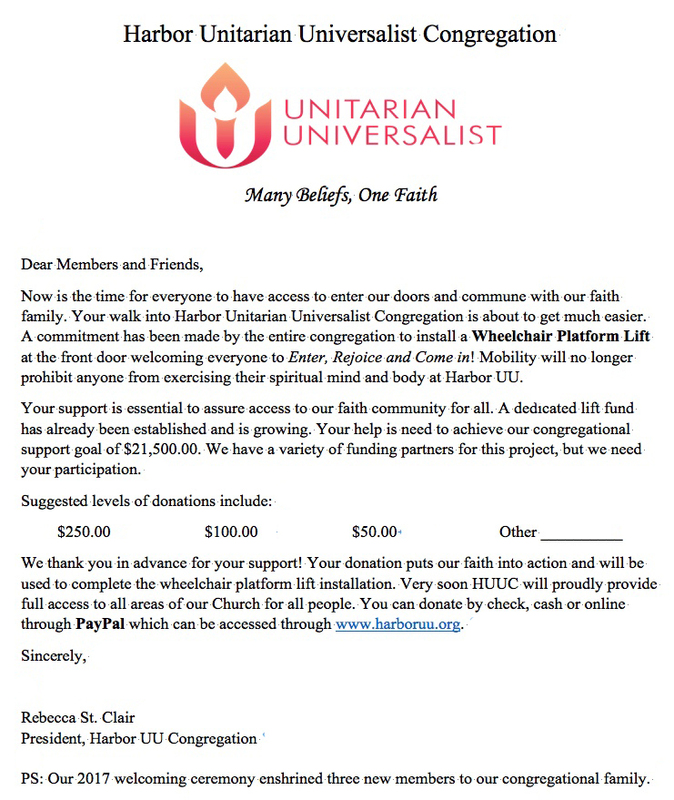 Of particular importance to our congregation currently is financial support for our campaign to install a new Wheelchair Platform Lift at our front door that would allow everyone to “Enter, Rejoice and Come In.” The letter below from congregation president Rebecca St. Clair explains the campaign. Please note PayPal can be used to make your donation. When you get to the PayPal donation page, please click the plus sign (+) to type “Special Instructions”, then type “Wheelchair Platform Lift” to designate on a “memo” line what your donation is to be used for. Incidentally, HUUC has received a “Chalice Lighter Grant” from the UUA’s Mid-America Region to assist in funding this project! Many thanks to the Sue McIntire, Rebecca St. Clair, & Poppy Hernandez for making this happen!